There are many blog entries out there on the inter-web regarding EDC (every day carry) items and they usually reference a certain ideology, specifically addressing situations where a person may find himself or herself in some kind of danger. This entry is not addressing such circumstances. While many of these entries are educational and entertaining, I personally do not have the resources to invest in tons of food I many never eat, build a bunker underground, or save up cases of guns and ammo that I may never shoot. 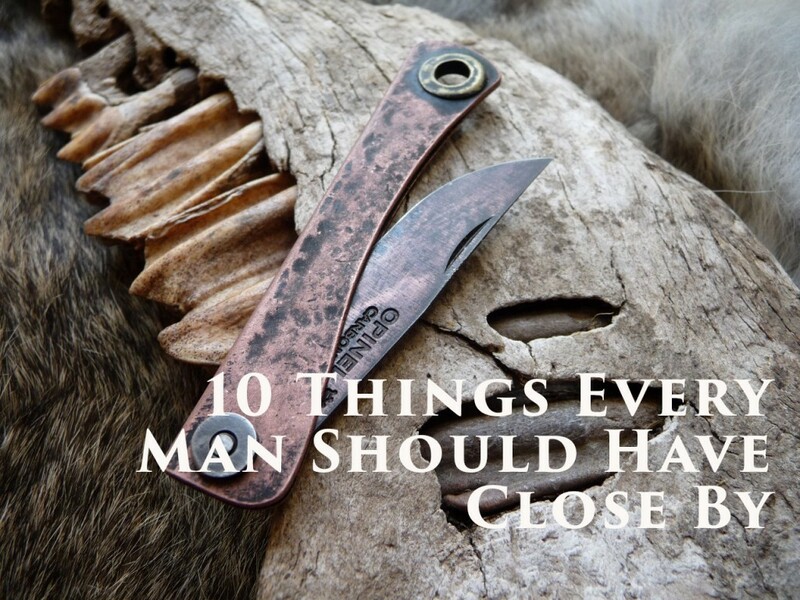 My â€œ10 Things Every Man Should Have Close Byâ€ list is intended to help leaders and what they may encounter in a given week. A Bible â€“ Over the years I have developed a definite preference as to translation and size of my everyday use Bible. I keep mine in the box that it came it to keep it from getting damaged, and it stays in my briefcase. This book is s much more than a book. I have been blessed to live in a country where I can own multiple copies of the Bible and is varying degrees of quality of print. Â My â€œpreaching Bibleâ€ is very precious to me. But as a leader, the Bible that you use the most will over time become very important to you. It is your love for this book that will rub off onto your children, and while they may not carry your copy, they will carry in their hearts your love for this book. But simply carrying it around with you does you no good. You have to set aside time to read it. A Moleskine Notebook. I prefer the Moleskine Volant Notebook (Set of 2 ), Pocket, Ruled, Antwerp Blue, Prussian Blue, Soft Cover (3.5 x 5.5). I have found that this notebook is of good quality, a great size (not too small as to prevent a complete thought being recorded to one page, not too big to carry with you in most situations). Itâ€™s cheap enough so that you feel free to write down everything you want. I found that if I paid too much for the notebook, or if it were too thick, I would hesitate to record the thought, sketch out the idea, record the potential blog topic, etc. You never know if your idea or thought will turn into something until you have scribbled it out on paper. I donâ€™t count this as a separate item, but I usually wonâ€™t write in my moleskine notebook unless it is with a black uniball vision (fine). An intriguing Book. I always have a book with me that I am reading. If you have it with you, you can take advantage of unplanned free time. There are many reasons that a leader should be reading, but the main reason for me is that it helps my mind to experience other’s thoughts and views of the world. Pocketknife/multi-tool â€“ the tool should be as large as the man can comfortably have in his pocket. It should not be so large that he wonâ€™t actually carry it, but should have enough function to handle a multitude of situations. I use my Swiss Army Huntsman knife many times every day. A Smart Phone â€“ The iPhone still amazes me. It just keeps doing more and more. It is my alarm clock in the morning, takes pictures of our most special moments, and it allows me to say goodnight to all my social media friends at night. The smart phone has become as indispensible as proper clothing. I use the flashlight function regularly and it has replaced my need to carry a separate flashlight, and it continues to replace items just about every day. Oh . . . and it is a phone. Laptop â€“ I have taken my Macbook Pro to the farthest interior of India, and many places around the world. I save my pictures to it, record blog entries onto it, surf the web, do graphic design projects, etc. I know that as I write this blog entry technology is beginning to offer great alternatives to the lightweight laptop, but as of today I would be hard pressed to live without it. A Hand Gun â€“ Men who hold responsibility need to be able to protect themselves and their loved ones. Make sure you get a carry permit and follow all required laws for your jurisdiction. A First Aid Kit â€“ I originally purchased a first aid kit similar to the link provided, but have since added several items to it (such as a headlamp, tubes of ibuprofen, EMT scissors, tick remover tool, etc.). Having a good and fully stocked first aid kit is essential. As people learn that you have thought through every detail in what you keep close by to you, they will begin to trust your leadership even more — especially if you are the “go to” guy when they have a headache. A Good True Story & A Joke â€“ There are many situations that can be defused with a joke or a story that gets peopleâ€™s minds away from the intensity of their feelings. Having a joke on stand-by makes you fun to be around. A Paperclip â€“ The best thing to have close by, is to be aware of whatâ€™s close by. MacGyver was famous for being able to get out of very dangerous situations by using what he had on hand at the time. Most of the time it was items like a pair of binoculars, a Swiss army knife, or simply a paper clip. There is a principle in bushcraft, that says, one should be “tool heavy” — meaning that you could travel fairly light if you take the tools with to make any item that may be needed in the bush. Instead of trying to figure out everything you need in life and trying to carry it from day to day, instead focus on learning skills and developing tools that will allow you the freedom to “make” what you need in the moment. One of these skills to develop is the ability to recognize the resources around you, or what others see as worhtless, and using them to your advantage.